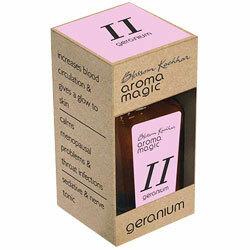 Aromamagic Geranium Oil - Increases Blood Circulation & Glow Skin, Calms Menopausal Problems & Throat Infections. Calms Menopausing Problems and throat infections. Increases Blood Circulation, and Gives a Glow to skin.